CEREC means we can quickly and economically restore damaged teeth using a durable ceramic material that matches the natural color of other teeth in your mouth. CEREC ® is an acronym for Chairside Economical Restoration of Esthetic Ceramics. What advantages does CEREC ® offer me? First and foremost, the restoration can be performed in a single session, usually in about one hour. With CEREC ® there's no need for us to make an impression and send it to a lab. We won't inconvenience you by asking you to return for a second visit. Second, the restoration is natural looking, because it is made of tooth-colored ceramic material. It's metal-free - no silver fillings to discolor your smile! The ceramic material is compatible with tissue in your mouth and is high-grade, anti-abrasive and plaque-resistant. It allows us to be extremely precise and save more of the healthy part of your tooth. 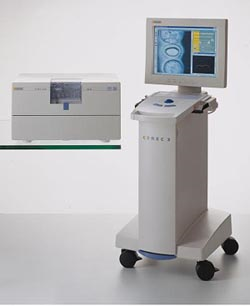 CEREC ® is a registered trademark of Sirona Dental Systems.